Commuters, kids, business travelers and anyone on the move: How would you like to carry a lite-weight version of your computer on your wrist? While Cloud Computing is definitely the wave of the future, with hundreds of millions of PCs shipping each year, a good amount of today's computing happens locally. And to that end, StormFly has found the answer to moving complete operating systems between devices, quickly, easily and securely. 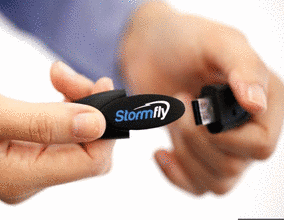 Not your Grand-dad's USB, with 16 GIGs, Stormfly fosters its very own local operating system. 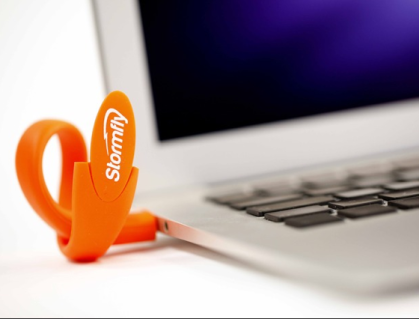 Bootable from a PC or Mac, StormFly is a robust, yet secure, super-fast USB 3.0, built into a cool wristband. And to boot (pun intended), it can accomplish all this without affecting the existing OS in those computers. In fact, it operates totally separate. Before you throw caution to the proverbial wind and leap wholeheartedly into the cloud, StormFly might be the better fit for you. There are marked disadvantages of cloud computing when you are not a larger company with a well-staffed IT department. Questions to be asked are possible downtime, security issues, excessive costs, lack of support and inflexibility, and if and when you might become locked into using the Cloud's proprietary applications or formats. StormFly's promos also warn that the "Cloud can be cumbersome, slow, sometimes ugly, and not always available." In stead, StormFly addresses the needs of the user-on-the-go that wants to move Operating Systems from one PC to PC. "With our early beta tests," notes CEO and founder Feargal Mac Conuladh, "kids really LOVE the product and do basically use it 'like' a PC (even if technically it is not a PC). Something about having their own environment, in an easily transportable way, really appeals to them." But similar to other bootstrapped start-ups, StormFly's parent company, Now Computing is hoping that Kickstarter will help them get off the ground running. Looking for $100K in their initial round of funding, this money will help the company come to market, and improve the product while crowdsourcing feedback from its first adapters. In interviewing Mac Conuladh this week, he indicated that he could not share costs with me because he is still negotiating with chip makers in Asia. "We are running an OS which means we are constantly performing read/write actions, something that can kill low quality USB's pretty quickly. This means we are spending quite some time and money to engineer a product that can stand up to this constant use over time," notes Mac Conuladh. As far as the results of a Kickstarter campaign, he feels that if the company was unable to reach its $100K goal, they would look to specialized investors in technology for additional funding. "In terms of volumes that will be determined by Kickstarter in the coming weeks, we hope to bring the product to full retail distribution very soon thereafter," adds MacConuladh. For those pledging $59 at the onset, they'll receive their very own StormFly in 'blazing orange,' customized with their name or company. That pledge will also entitle the donor to an automatic Backup Service that will cover them if the wrist band is lost or stolen, and the company promises to send a new one with all the files and applications that were saved on the home folder, within 24 hours. Already at 18% of their goal (as of this posting), for those who pledge $4,000 or more, the donor's or donors' reward will be an exciting trip to Barcelona where they will be invited to dine and brainstorm with the StormFly team. 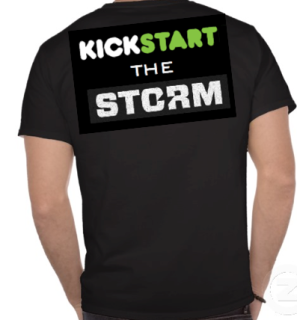 Additionally, these top-tier funders will receive a two-year back-up and an "I Kickstarted the Storm" limited-edition-early-backers t-shirt. Who will be their first-taker? Want To Put Your Child's Name On An Awesome Storybook Pillow? When you live in the cloud, you need to be connected. Sometimes in rural areas, the connection is not always there. We have been using Google Calendar, which in essence has relegated my formerly paper calendar to the cloud. So far, I have not had to look anything up when Internet access is interrupted. But that day will come. And then will we return to paper calendars? Stormfly has just released a 32 Gb version after requestss from backers of the Kickstart project. It has upped the project 10% in 8 hours time. Stormfly is picking up steam by listening to its backers! "Cloud can be cumbersome, slow, sometimes ugly, and not always available." These concerns are unfounded and verge on FUD, choosing a leading cloud provider will deliver a secure, reliable and scalable set of applications for users whether it's google apps or something else. "StormFly also comes with an automatic Backup Service so that if you lose it or it gets stolen, we can send you a new one with all the files and applications that were saved on the home folder within 24 hours." No mention of how secure available or robust their presumably Cloud backup service is? I think i'll pass, a solution looking for and potentially causing a bunch of problems. Great project. Recently the StormFly team also made a 32GB version available! And it isn't just a usb-stick, it is a small SSD hard drive.. So, if you're interested, please support this project! Nice package but nothing new. What Will the World Look Like in 2100? Genetically Modified Salmon, Will You Eat It?